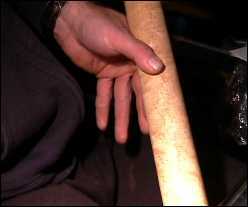 Michael: A good vibrato and bending technique is essential to playing blues guitar. In many ways, a great vibrato and bending style is as important as knowing the scales and licks themselves. Take a player like B B King, his signature sound is in his lightning fast vibrato and expressive bends. B B can literally take one note and touch the soul of any listener. 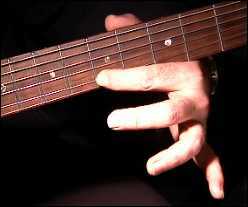 This interactive lesson will cover various exercises that will help enhance your blues skills. 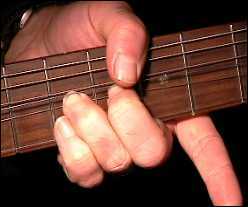 Michael: Notice how the thumb helps in holding the position, the fulcrum point of the inside of the palm, the first finger holding the fret position on the 2nd string/5th fret and how the hands and other fingers pull and retract very quickly. This my take you time to develop, but it's well worth the benefits to the sound of your solos, trust me! I use to spend HOURS & HOURS on just my vibrato. Michael: Now you can bend the note a half-step and play the same exercise, notice the slight difference in sound, it's very subtle, but the sound is different, this is how B. B can use a couple of notes and come up with melodies. It's all in the bending and vibrato! Teacher: Exercise 5 uses the 6th fret/3rd string to 5th fret vibrato and back, then a half-step bend on the 7th fret, then whole-step bend, back to half-step bend/vibrato and back to the 5th fret fast vibrato. This should give you an idea of how many combinations you can come up with and how B B KIng creates his expressive sound with using a few notes, some bends and vibrato variations, the combinations can virtually unlimited! Michael: Albert King was the master at bending, he could create this tortured blues bending sound just by playing just outside of a whole, half, quarter-step. He basically used all the notes in between to create this tension in his licks. Michael: Notice on the last exercise the random use of various bending intervals, you can make up your own exercises as well and it's fun to do, just make sure you don't have anybody listening, it might be irritating to some, but hey, this is ART man! Go for it! Michael: Well I hope your fingers had a great workout, this training will significantly make a difference in your playing over time, don't give up, your hands will get tired, simply rest for awhile and keep at it and play the blues!